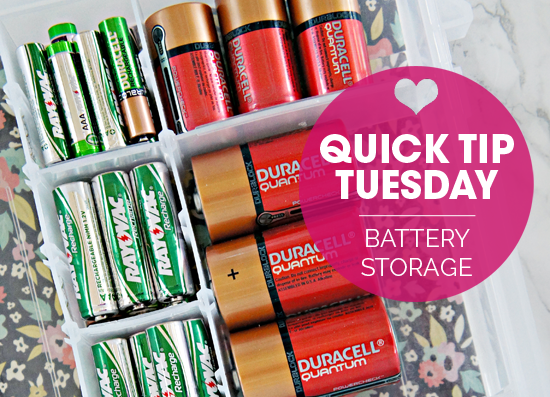 I have been loving this Quick Tip Tuesday series because it has given me an excuse to take a break from our big home improvement projects and focus on the fun and quick little organizational hits. 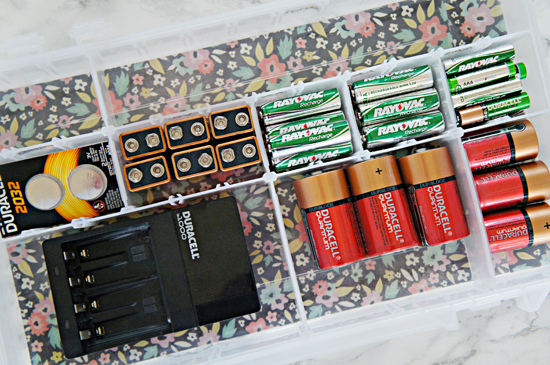 This week's tip comes requested by a sweet reader on Facebook, who asked if I could share how we organize our batteries. Of course I will I thought... After I finally get them organized! With three little boys, batteries are a daily topic. Between remote control toys and video game controllers, we always have random batteries laying around. And what is more frustrating than putting new batteries into something, only to find out they are fully drained? I know, BIG problems. In the past, I had a small, lidded bin of batteries that lived in our entryway drawer. It was always empty, and the storage wasn't enough to house any of our larger sized options. I was excited to finally put a better system in place this week. I started with a compartment organizer. These boxes are the best for organizing anything small. Think hair accessories, jewelry, small hardware, crafts, beads... You can find these containers at most stores or on Amazon here. The main thing I looked for is that the inside offered adjustable compartments. This would allow me to create appropriately sized areas for each variety of battery to be stored. First, I completely removed the lid from the box. My number one tip with any organizing project is to think about how likely you will be to maintain a system. When I thought about past attempts at organizing small items, such as batteries, I have failed because there were too many steps to access the system. If my family has to open a drawer, take out a bin, open the lid, etc... I have failed them and myself. So this time I planned on creating a system that was much easier, and that included a lid-less organizer. ... as well as gold labels to each compartment. The most important thing to know when storing your batteries is that the ends should not touch other batteries or anything metal. That can cause the batteries to become activated and drain their power. So if anything, this storage will ensure our batteries last longer and that they are being stored in a safer manner. The adjustable compartments in this case keep the ends from coming in contact with one another. It also allowed me to divide the batteries out by size and type, and even holds the awkwardly shaped wall charger. The back empty compartment can act as a place for the boys to toss batteries that require charging (because 99% of the time they move too quickly to actually do it themselves), and saving the dividers will also allow us to reconfigure the case if we ever need to do so down the road. I placed the lid and extra divider pieces under the case, and popped it in a drawer in our family room. Now the kiddos can open the drawer and see everything at a glance. No case to take out or open, it is all right there ready to be raided. So thank you dear reader for getting me "charged" up to get this little project done. It was super quick and easy to put together and my fingers are crossed that it is also simple enough for the entire family to maintain. This is a super great idea! Thanks so much for sharing! You always add a special touch to every project. These quick tips are great! What a GREAT idea! And I love the added touch of the decorative paper at the bottom. I have to go get a container tomorrow and organize our batteries. Hi Melissa! I just used piece of 12 x 12 scrapbook paper cut to size, I have bins of it that I have been trying to use up. To affix, I added Mod Podge to the bottom of the container and stuck the paper to the underside, face up. 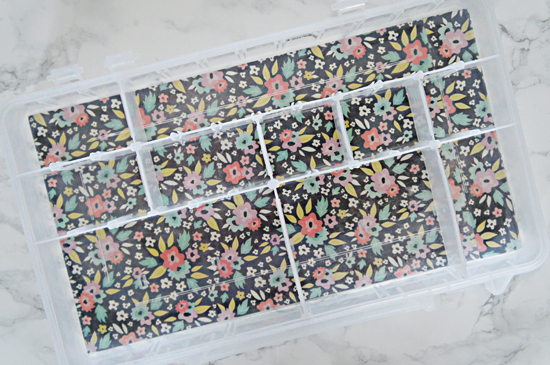 The Mod Podge dries clear, so it worked well putting it on the bottom side of the container vs, having to cut it around the compartments. xoxo! I also store a screwdriver in my battery storage drawer. All kids toys require one! This is what better than what I have - all our batteries are in a Tupperware bowl! Granted, it's an orange one, and we only have AA or AAA batteries, but certainly not the most organized! I totally agree with "lidless". Having to remove the lid is enough to keep everyone from using the system. The nice thing about an organizer like this is that it keeps the batteries from rolling around and de-charging each other. So going to copy this! I need to get me some Mod Podge! Love how you added the color/design! Never would have thought storing batteries could look so elegant. This is definitely about twenty steps wayyyy up from my junk drawer (guilty!). Great tip! Hi Jennifer! I love your blog and I love this idea. One thing to mention, though. 9 volt batteries can cause fires if their terminals touch each other or other metal. It is recommended that electrical tape is placed over the terminals to make sure nothing touches them. I know your 9 volts are all upright, but someone who reads this may just throw theirs in the box all willy nilly. I've never heard that about batteries before....! I'm shocked...! I have just put all my batteries in one of these divided plastic boxes, but it's not DEEP enough to have the 9 volt ones standing up. Are they okay if they're lying down but the terminals aren't touching each other....? I believe that as long as the terminals are not in contact with anything metal, you should be OK. I would just be sure the terminals are covered or the batteries are being stored with dividers. If your children have access to the batteries, there is the possibility of their 're-arranging' the 9V. I'd be safe and do the electrical tape. I adore those cubbie tray thingies!!! And of course your paper underneath is adorable! Very clever way to store batteries Jen. It is definitely something I need to work on in my house. Batteries have always been an issue! This is wonderful! I especially like that the container is tall enough to stand the 9V batteries, which are always a hassle to fit in anything. Love this tip! Great idea! Thanks! 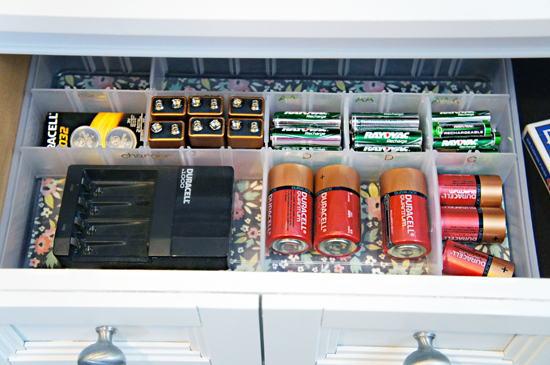 I have my batteries semi-organized in a dedicated drawer, but I didn't know they could un-charge each other! I learned something today - now I need to revisit my system! Another tip idea for you if you care to share...more cleaning than organizing though...how do you handle pet hair in the house? We have an outdoor Lab, but on some of these frigid Minnesota winter nights he needs to have a slumber party in the house. I'd love to hear any tips you have for handling the stray pet hairs, or just what method you use to keep your floors looking ship shape in general. This is how I store our batteries, too. (Though now I think I need to add some cute paper!) 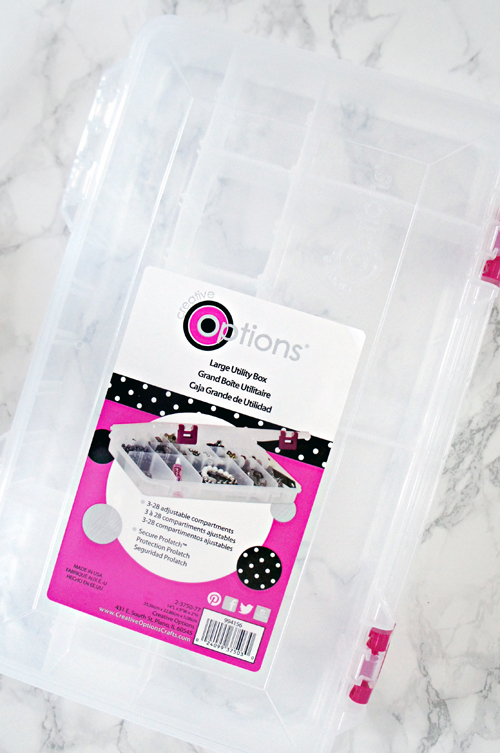 My quick tip to add to your quick tip- these type of containers tend to be so much cheaper at hardware stores compared to craft stores. I got a nice big one for $5 at Home Depot, whereas all the craft store options were a lot more. Now off to raid my paper stash! This is a really great idea. My batteries all get lost in the bottom of my messy drawer! My husband bought me a small multi drawer storage unit from a big box hardware store. It's mounted under the cabinets in my laundry room and over my washing machine. Each battery type is assigned a drawer. It works wonderfully. The kids and I can easily get to the batteries and they are not in the way. Thank you for this! I bought one for batteries, and another for all of my Command hangers and felt floor protectors. Since I have two rather large junk drawers in my kitchen, I discovered I had a lot more of these things (except the batteries, we're always low on those!) than I realized. I think this little investment will save me money in the long run. This is also how we store our batteries and it works great! I used to sell candles so I used my old case from my samples. Since we don't have room for a junk drawer and we don't have a ton of batteries, I also use it for odds and ends thst would normally end up im the bottom of a drawer. - I attended graduate school and have lots of "paper", documents that I want to store but don't know how to do it without taking up lots of space... or keeping it organized...... paper clutter is the worst. What is the sku number for the plastic organizer. I want to order it right away. Thanks!! Thanks for the tips on Battery organization. One thing I think ought to be mentioned which I haven't noticed in any other comments is that not only does organization make it easier to find the batteries when you need them but it is extremely important for fire safety reasons, too. A lot of people don't realize that even "dead" batteries still have enough charge that if allowed to come into contact with other batteries, or anything metal, they can cause a fire to start. I have included four links to a series of videos put out by Kids and Character talking about just this issue. The creator and producer of that company had his own house burn down because he set some old batteries out in his garage to recycle at a later date. It is very eye opening and I hope that you might include the links on a post in the future. This could save someone's life. PS If clicking on unknown links concerns you, you can find all these videos on YouTube under the search Kids and Character Fire Safety. Love this idea! 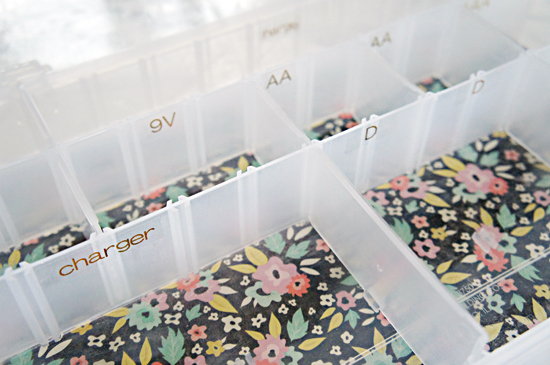 Much safer and organized way to store batteries. Mine are always getting jumbled in a junk drawer. I am absolutely loving your blog! It is helping me with organizing my home. And your ideas are leap years ahead of mine as I am challenged by organizing. ist die Augenlidkorrektur eine Vorwärts... Möglichkeiten, um unschöne Mängel am eigenen Körper zu eliminieren Oder zumindest zu erleichtern. Die häufigsten Gründe pro eine Nasenkorrektur sind die so genannten Höckernasen, bei denen gegenseitig gen dem Nasenrücken eine „Beule“ befindet.